Not all platelet rich plasma (PRP) preparations are the same. The majority of PRP preparations are created by bedside centrifuge units. At Regenexx we are constantly striving to improve clinical results. Our state of the art cellular laboratory enables us to experiment on different ways to get more platelets out of a given sample. The results demonstrated that the centrifuge techniques similar to bedside PRP did NOT produce the best platelet concentrates. In fact, they tended to produce less platelets and more non platelet matter than other techniques. A proprietary simple laboratory technique has been developed that provides more platelets and a much cleaner isolation. It is called APC: autologous platelet concentration so as to differentiate it from PRP. It produced 237% more platelets when compared with traditional bedside centrifuge units. Below is a graph that demonstrates the significant differences. The graph on the left has a wide mountain reflective of significant non platelet matter whereas the graph on the right has a narrow tall peak reflective of a cleaner isolation. Total number of platelets on the left is 200 vs 12oo produced by the laboratory. Bottom line: laboratory prepared autologous platelet concentrate provides a larger number of platelets in a cleaner isolation. This difference translates to improved healing and faster recovery. Low back pain is a common problem. Episodic discomfort following purposeful activity is typically self-limited. The problem is when that knife in your back, that lancinating pain that takes your breath away with minor motion becomes chronic. 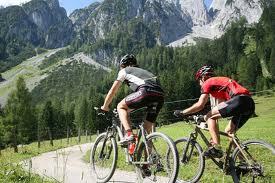 Physical therapy and myofascial deactivation are often helpful in breaking that cycle. At the Centeno-Schultz Clinic, when conservative therapies fail, x-ray guided epidural injections of low dose corticosteroid or platelet derived growth factors are used and can be beneficial. Unfortunately some patients do not respond to conservative therapy. 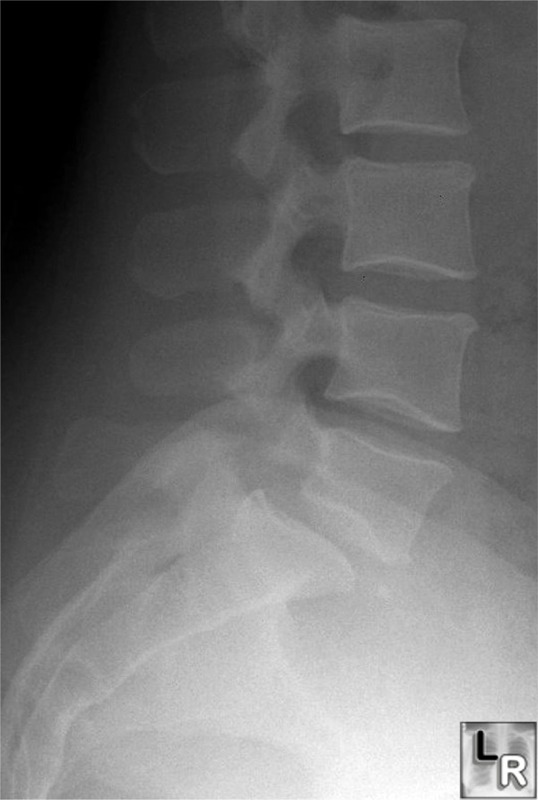 NQ is a 39 y/o patient with 3 yr history of lower back pain who failed to respond to conservative and injection therapy. She declined surgery and opted for the Regenexx procedure which afforded her the opportunity to use her own stem cells. 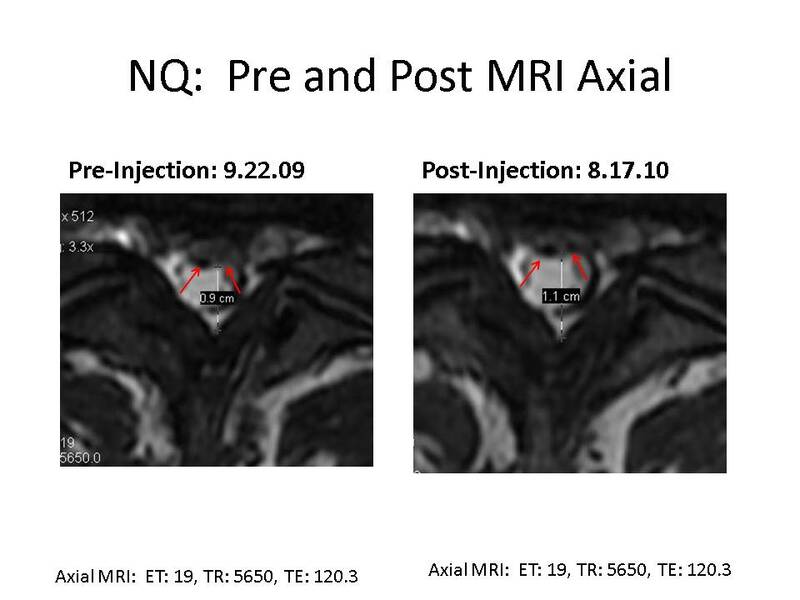 NQ had her own mesenchymal stem cells injected into the posterior aspect of her L5/S1 disc on . NQ returned to clinic today, 4 months post injection reporting 50% improvement in her lower back pain. She has been able to increase her level of activity and is enjoying the summer with her family. This corresponds with her postprocedure MRI which is below. There is a reduction in the size of the disc bulge which is identified by the red arrows. 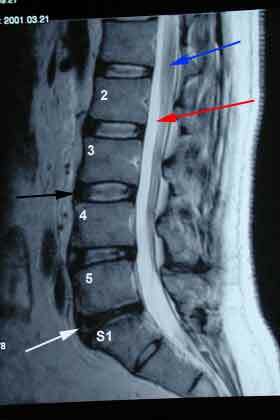 The diameter of the spinal canal is increased from 0.9cm preprocedure to 1.1cm postprocedure due to a reduction in the size of the disc protrusion. Stem cell therapy for lumbar degenerative disc disease holds great promise as it eliminates the risks of anesthesia/surgery and the often profound biomechanical changes that occur as a result of cutting through and compromising the integrity of supporting ligaments, muscle and fascia. Our thumbs are critical. They enable us to perform important functions such as shifting gears on our bikes, planting poles in mogul fields and opening bottles of wine. Repetitive activities including texting can led to thumb pain and dysfunction. 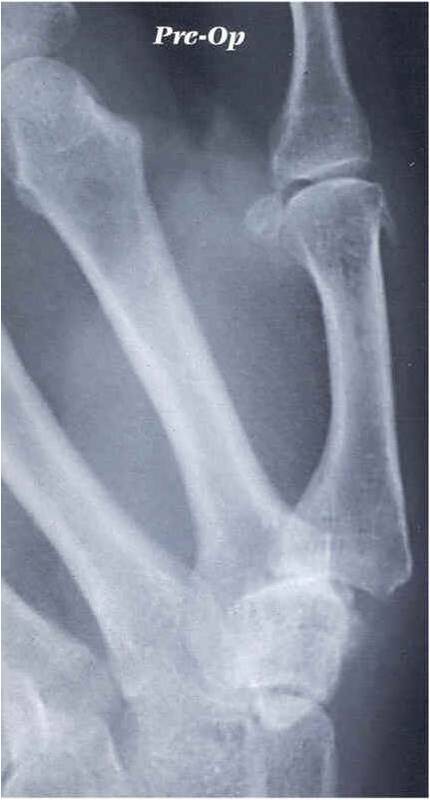 Arthritis of the thumb, knows as the CMC (carpometacarpal) joint is more common in women. Conservative therapy includes physical therapy, trial of non-steroidal anti-inflammatory medications, night splints and corticosteroid injections. Surgical therapies include large invasive procedures which include fusion of the joint, tendon wrap or joint replacement all of which are painful and have limited success. Now patients have a non surgical alternative. The Regenexx procedure allows patients to use their own mesenchumal stem cells for many orthopedic conditions including thumb arthritis. We have completed a 1 year follow-up on 6 patients who underwent the Regenexx procedure. 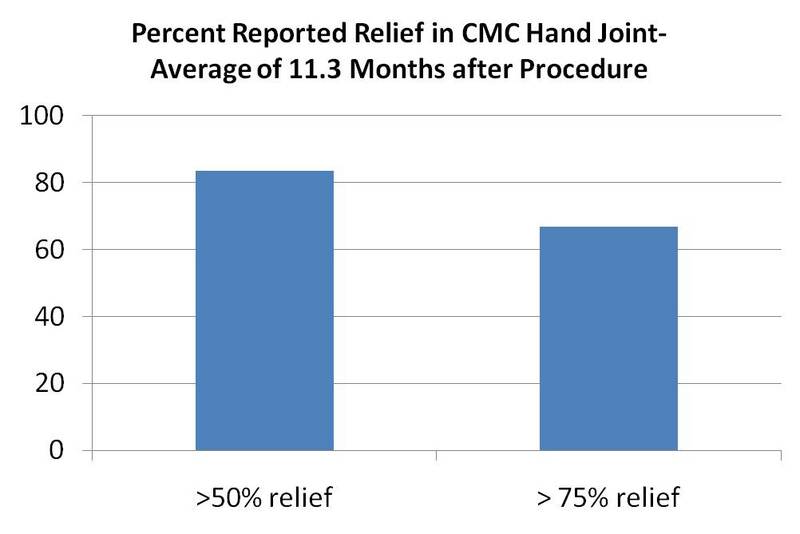 The average reported relief by the patients was 70% with over 80% of them reporting more than 50% relief and 66% reporting more than 75% relief. No of the patients went on to surgery. 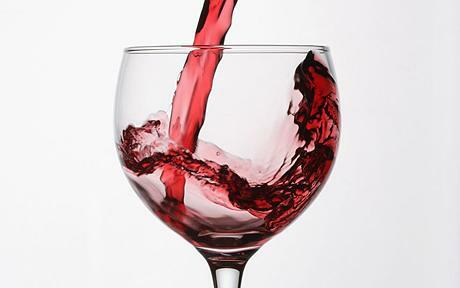 Salute to our own regenerative properties. Hip pain can be quite disabling affecting a patient’s level of activity and quality of life. An accurate diagnosis is essential. At the Centeno-Schultz Clinic we are committed to identifying the source of a given patient’s pain so that an appropriate treatment plan can be established. TM is a very active 78y/o patient with a 3 year history of left hip pain which was intermittent in frequency, 8/10 in severity, progressive in nature and localized along the outside aspect of the hip with radiations into the outside aspect of the knee. Aggravated factors included walking and descending stairs whereas alleviating factors included rest and NSAID’s. TM had undergone PT, chiropractic care and x-ray guided injection of steroid into the hip. He was interested in the Regenexx procedure where a patient is able to use their own mesenchymal stem cells. He rejected both his PCP and orthopedic surgeon’s recommendations for total hip replacement. Escalating pain forced TM to reduce his activities and one of his true passions: golf. Physical examination was significant for very limited flexion and extension of the lumbar spine, left leg limp, weakness in the left foot with diminished sensation to light touch and temperature. Left hip did have mild restriction in range of motion and minimal pain. I was concerned about the radiating character of his pain along with abnormal neurologic examination. MRI of the lumbar spine was obtained and was significant for multiple level degenerative disc disease, nerve root irritation and narrowing of the central canal (stenosis). TM did not undergo stem cell therapy because his left hip pain was arising from his lumbar spine. This was confirmed with a 1 cc injection of local anesthetic into the specific area in his pain. TM returned today after three x-ray guided injection of platelet derived growth factors into the lumbar spine. 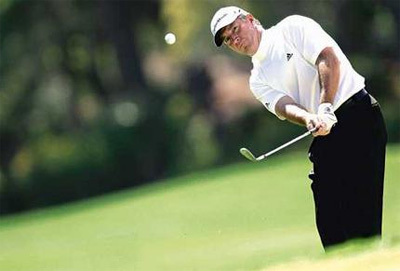 He reports 100% reduction in left hip pain and improvement on his short game. Stem cells, platelet rich plasma (PRP) and prolotherapy are powerful therapies which can provide dramatic results when appropriately applied. When stem cells, PRP are not appropriately utilized, clinical results are often compromised. The correct diagnosis and an understanding of what biomechanical forces led to an injury and pain is essential. This is the cornerstone of the Centeno-Schultz Clinic. Ligament stability, muscle function and neurologic function are some of the areas reviewed when making a diagnosis. JQ is a 79 y/o dentist who had a 15 year history of bilateral ankle pain who was interested in the Regenexx procedure whereby he could use his own mesenchymal stem cells. None of the surgical options were attractive given the extensive rehabilitation and risks associated with both anesthesia and surgery since he had multiple medical conditions including hypertension. The pain was constant in duration, 7/10 in severity and progressive in nature. JQ had strained his ankles years ago and never received therapy. As a dentist, JQ had intermittent lower back pain. Physical examination was significant for right leg limp secondary to pain, limited flexion and extension of lumbar spine, abnormal neurologic exam in lower extremities, weakness in the foot muscles and loose and painful ankle ligaments. MRI of the right ankle was significant for osteoarthritis and strain of the supporting ligaments. An MRI of the lumbar spine was obtained given his significant findings of physical examination. The study was significant for two level disc disease, disc bulges, arthritic changes and irritation of the existing nerve roots. A diagnostic low volume injection of local anesthetic into the lumbar spine resolved 90% of his bilateral ankle pain. Subsequent therapies included platelet derived growth factor injections into the lumbar spine along with prolotherapy of the ankle ligaments. The patient did not require stem cell therapy into his ankle because the majority of his ankle pain arose from the lumbar spine. Bottom line: accuracy is everything. Patients with elevated cholesterol and triglycerides tended to have poor cell expansion and clinical improvement. A recent article substantiated our observations. Wildi, et al., demonstrated that elevated cholesterol and triglycerides were associated with bone marrow lesions in asymptomatic patients. Bone marrow lesions are areas of abnormal MRI signal that represent necrosis, bleeding and edema and strongly predict subsequent overlying cartilage loss. Bottom line: Regular exercise and proper diet may not only be helping your heart but your joints as well. 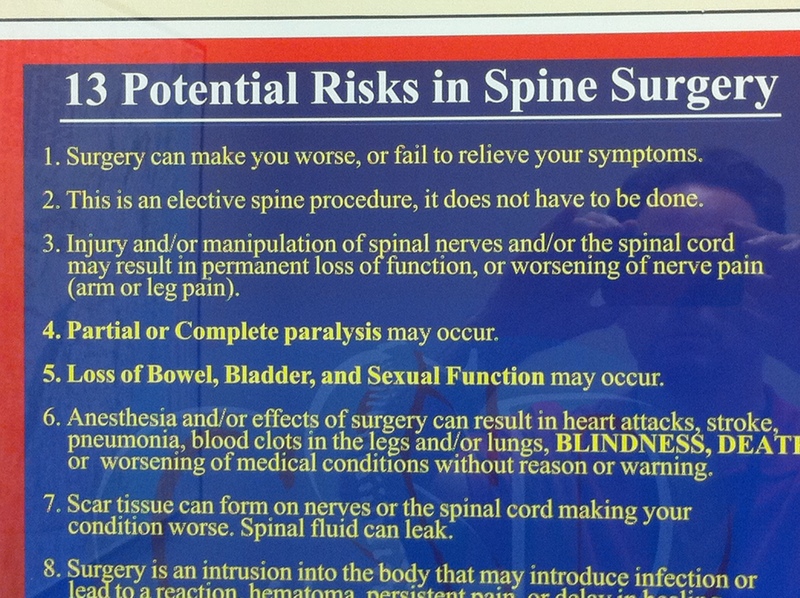 While attending a medical conference, I came across this poster which tells the true risks associated with spine surgery.